"Have too much zucchini from your garden? Try this quick and delicious summer recipe using your grill." My husband and I both thought these tasted like warm pickles. I kept my opinion to myself to see if it was just me, but then he pushed his portion onto my plate and said the same thing! It's simple, fast and gives the squash a good flavor. I pan fried instead of grilled and it works just as well. I don't usually care for Italian dressing, but I love Zucchini so I thought that I'd give it a try. Boy, am I ever glad that I did. Thanks for sharing it with us Nancy. 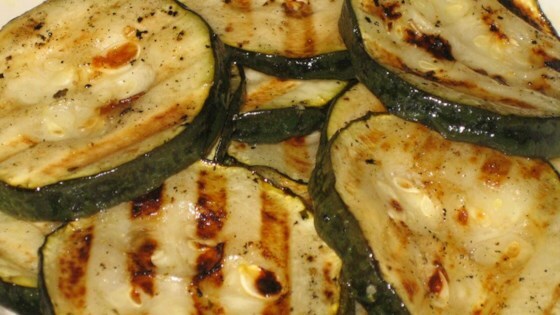 This is another easy way to prepare grilled zucchini. We thought it had a very mild flavor. Will do again.